Last night’s crowd at the Boston University Track and Athletic Center didn’t come close to filling the place, but it was enthusiastic and appreciative of what was happening on the track below. Circling the oval with little apparent effort, the trio of Cam Levins, Galen Rupp, and Sam Chelanga cruised through 3k in 7:55, and it was clear that things were just beginning to get interesting. The cheering, which had been moderate through the first half of the race, began to swell with each successive lap of the 5000m, the evening’s final individual event. I had arrived around 6:30 and taken a seat high up in the stands. Although it sounds stupid to admit it now, I had actually been looking forward more to the women’s 1000m, which had been billed as an American record attempt by Oregon Project athletes (and USA World Championship teammates) Mary Cain and Trenier Moser. I dunno, I guess I’ve just hopped aboard the Cain train, expecting the 18-year-old to do something astonishing every time she toes the line. In the end, Cain’s race was good, but not spectacular. She eked out the win over Moser by a tenth of a second, after trailing/drafting the entire race. Cain’s time of 2:39 was far off Jen Toomey’s American Record of 2:34, but it was announced as a World Junior Indoor Record, and probably would have been about her ten-thousandth American High School record, if the USATF allowed pro athletes in high school to set HS records. If my anticipation for the 1000 was influenced by Cain’s celebrity status as track’s most recognizable teen idol, my hope for the 5000 was much more primal. I wanted to see another member of my species run really, really fast. I was prepared to yell quite loudly, as was everyone else around me, to make sure that Galen Rupp and anyone near him at the time would have no doubts about what I wanted. And I was not disappointed. With about 1600 to go (8:58), Rupp and Chelanga began ripping off sub-31 second laps, leaving the immensely hard-working, but increasingly mortal Cam Levins to fend for himself. No longer did it look easy; it looked like an all-out assault on time and distance. By now, everyone in the stands was into it, and the noise followed the two leaders around the track like a maelstrom. With about 1000 to go, Rupp dropped a sub-30 200, and in a matter of a backstretch, had opened a gap on Chelanga. As he came around and hit four laps to go, the clock read 10:59. It was a foregone conclusion that he would be under Lopez Lomong’s old American Record of 13:07; the question now was whether he could conceivably run under 13 minutes. The crowd urged him on, and Rupp threw everything he had into the effort, but he was flat out and running 30-point laps now. He split 2:01-something for the last 800, finishing in 13:01.26 and taking nearly six seconds out of the Lomong’s time. Chelanga, who had looked for a while as though he might just have enough to beat Rupp, finished strong to run a personal best 13:04.35. 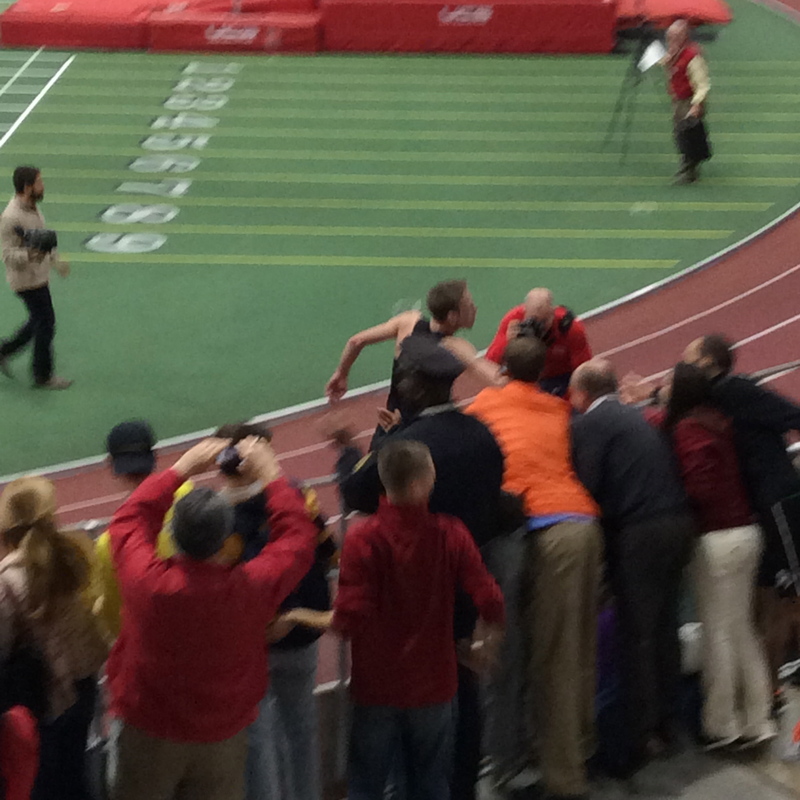 Levins, a half lap back, finished in 13:19.16 to set a Canadian record. Rupp thanks the crowd after setting the AR. So, once again, Salazar and his athletes had a successful visit to BU. There’s no doubt that the draw of having world-class athletes compete on a world-class track with a small, but very enthusiastic crowd has proven to be a great formula. With two more chances to see the NOP athletes at BU, I wonder how big this will get. I know as I was leaving the building to jog back to my car, I was surrounded by runners, and everyone was talking about how they couldn’t wait to get to a track and run some blazing intervals. If watching someone run fast can make us run faster, there will be a lot of PRs set this weekend. This entry was posted in Indoor Track, Pro Runners. Bookmark the permalink.